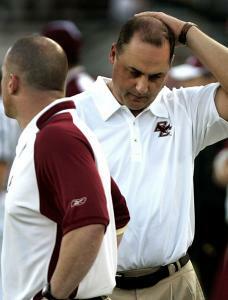 Only the baldest of Eagles remember the last time Boston College's football team played in Miami in January. The Orange Bowl was a consolation prize for a perfect 1942 season that was wrecked by Holy Cross, dashing hopes of a second national championship in three years. This time, getting there would be validation for a program that hasn't played in a major postseason contest since Doug Flutie hailed Mary 24 years ago and BC was full of grace. "Nothing like this has been done around here for a long time," said freshman tailback Josh Haden, whose 18th-ranked teammates will face Virginia Tech tomorrow afternoon in Tampa in a rematch of last year's Atlantic Coast Conference championship game. If the Eagles win, they'll be guaranteed a date in the Orange (probably against Big East champion Cincinnati), their first appearance in a BCS bowl after nine straight years of holiday sojourns in Tucson, Boise, Detroit, Orlando, Honolulu, and elsewhere. "Every football player at every school, their goal at the beginning of the year is to win their conference championship and play in a BCS bowl," said BC athletic director Gene DeFilippo. "To get there is a very big thing. It says that your program is among the elite." Not that the Eagles have been flapping around in the second tier. BC, which was ranked as high as second last year, plays in a major conference, has a couple dozen alums in the NFL, has won 56 games over the last six years, and has the best all-time bowl winning percentage (.684) in the country among BCS conferences. "We've played for the ACC championship two years in a row now," observed DeFilippo. "We were 10th in the country last year and we're 18th this year. We've been to nine bowl games in a row and we've won eight of them. But to win a BCS bowl would be really big." It isn't that the Eagles haven't appreciated all those trophies from the Insight.com, Jeep Eagle Aloha, Music City, Motor City, Diamond Walnut San Francisco, Continental Tire, MPC Computers, Meineke Car Care, and Champs Sports people. But they have December written all over them. "If you don't make it to the Orange Bowl, then you're just another team in the ACC," said linebacker Mark Herzlich, whose teammates will play in the Music City again if they lose tomorrow. "Sure, you did a good job, but you're not noticeable." Not on the national stage, anyway. BC lived there for four wondrous seasons between 1939-42, when it went to the Cotton, Sugar, and Orange bowls and won the 1940 national title by stunning Tennessee in New Orleans, with the varsity returning to South Station to a crowd of 100,000 celebrants. It was more than four decades before the Eagles became nationally noticeable again, when Flutie led them to a Cotton Bowl victory over Houston after they'd knocked off Alabama and Miami on the road. "You say, 'What the hell are we doing here?' " mused then-athletic director Bill Flynn. The 1984 season put BC back on the map. The coaching staff no longer had to explain the difference between Boston College and Boston University to confused recruits. "Kids who wouldn't open our mail three years ago are now begging to come here," one athletic department official said that autumn. Life A.D. (After Doug) wasn't quite so glorious - six losing seasons in the next seven years. With coach Tom Coughlin came the renaissance and a giddy ride in 1992, a 7-0-1 start with a huge upset at Penn State that rekindled dreams of Orange, Sugar, and Cotton - until Notre Dame shot down the Eagles, 54-7. That was the first of what became a series of speed bumps that knocked seasons out of kilter and detoured BC to less enthralling holiday destinations. The following year, just a week after the Eagles' astounding 41-39 decision over the top-ranked Irish in South Bend, Ind., that put them on the cover of Sports Illustrated, they lost to West Virginia at home in the final 68 seconds after fumbling the ball away and ended up in the Carquest Bowl. "I'm having such a hard time watching it," Coughlin said after reviewing the game film that showed his team making five turnovers. "It's just so frustrating to go through it again." That's how it's been for the last four years at The Heights, with one untimely stumble after another keeping BC out of the BCS. In 2004, the Eagles' last season in the Big East, they were hammered, 43-17, at home by a so-so Syracuse team in the regular-season finale. In 2005, a loss at North Carolina diverted them from Florida to Idaho. In 2006, a final-game loss at Miami sent them to Charlotte. But last year's loss to Virginia Tech in the title match hurt the most. BC, which had beaten the Hokies on the road in October, was up by 9 points before halftime when a blocked conversion turned the game around. Tech went on to win, 30-16, and proceeded to Miami. The Eagles went to Orlando to play Michigan State. "We've been looking forward to this game since last year when we lost it," said receiver Rich Gunnell. Other than in their dressing room, few thought this BC team would get a do-over this year. The Eagles, who'd lost quarterback Matt Ryan (now directing the Falcons) and nearly a dozen other starters, were picked to finish fourth in their division. After consecutive ACC losses to North Carolina and Clemson, they were 5-3, their worst eight-game record in five years. "We did have some losses, but the fact that a couple of them came from the other division really helped us," reckoned Herzlich, whose teammates were 4-1 in the Atlantic. "When it came to the end where we had three games that we had to win on our side, we won the head-to-head matchups and that got us to where we needed to go. If we had won against Georgia Tech and North Carolina and had lost to Maryland and Florida State, it'd be a whole different story right now." These Eagles made it to the title game by taking a page from their hockey brethren, who won the national crown last season by peaking for the stretch run and winning their final nine games. "Our team had 11 losses, but we got hot," said DeFilippo. "It makes a tremendous difference." BC has had better hockey teams that didn't collect rings and better football teams than this one that have played for lesser stakes. "I think we have more journeymen than we have stars," said coach Jeff Jagodzinski, who has 22 freshmen and sophomores in his two-deep, including his entire offensive backfield. "Last year it was Matt, Matt, Matt. Now it's everyone in the room." These Eagles won four straight in November. That hasn't happened since 1986, when they soared from a 1-3 hole to run the table. One more victory not only gets them their first conference ring, it also gets them to a big game in January. "It's something that hasn't been done here," said Jagodzinski. "If you win the championship, along with that comes a real prestigious bowl." It won't be for the national championship and it won't put BC alongside the USCs and Ohio States and Oklahomas, who play in a major bowl more often than not. "Even if we do get to a BCS bowl, some people will say that we're not one of the elite teams," acknowledged Herzlich, whose teammates already have been spurned by three lesser bowls. "That's just something that comes with the territory of Boston College. I don't foresee anything changing. Preseason polls next year, we'll probably be at the bottom of the list. That's how it happens and that's the way we like it. It's something we joke around about: Look where they have us now. Just wait till the end of the season, then see where we're at." Not in 66 years have the Eagles been to the Orange Bowl, and they didn't win it then. Doing it this time undeniably would make them noticeable again. Now, as before, BC first has to get there. "It isn't like, hey, we've arrived," cautioned Jagodzinski. "We haven't done it yet. We've got 60 more minutes."